Rowan Trollope's passion for tech comes through when he's on stage unveiling the latest Cisco collaboration tool or when he's simply having a one on one conversation. Rowan Trollope's passion for tech comes through when he's on stage unveiling the latest Cisco collaboration tool or when he's simply engaging in a one-on-one conversation. We recently had the chance to question Rowan about his many roles and responsibilities at Cisco and what drives him to continually push himself and his teams to create the next big thing to change the way people live and work. Focus Magazine: You're Cisco's SVP of IoT and Applications. That's a big title, but can you explain what that means and what you oversee? Rowan Trollope: I joined Cisco almost 4 years ago to lead the Collaboration Technologies team. 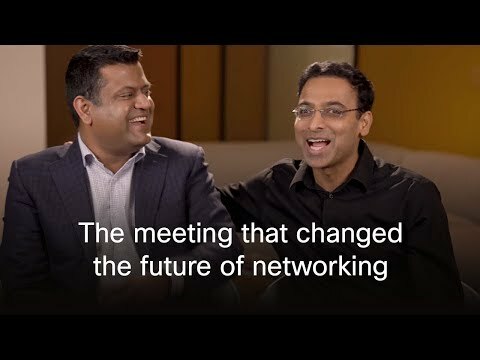 During that time, we have revitalized Cisco's collaboration portfolio and with the recent launch of Spark Meetings and Spark Board, believe we are modernizing the way people work. Last April I took on additional responsibility with Cisco's Internet of Things (IoT) strategy and customer offerings. As I did with Collaboration, I took the time to really understand how we could provide significant differentiation for our customers at a time when ‘connected things' are pushing the scale and architecture of the Internet as we know it. I'm excited about the strategy we have laid out in this area and look forward to a busy 2017 as we provide new solutions to the market. Focus Magazine: Do you have a typical day—and if so—can you describe it? Rowan Trollope: I hope not – I would be very bored if my days became typical. I thrive best when new opportunities, new challenges are presented. If I had to quantify where I spend my time, it does go towards helping our customers, partners, and employees with their questions. I rely heavily on Cisco Spark to keep me in touch real-time with these folks through group chats like "Ask Me Anything" spaces or 1:1 spaces for more direct questions. Each time a customer reaches out, I am able to quickly connect them with experts on my team through Spark while still being able to observe and chime in when needed. Focus Magazine: Collaboration started the year with a bang— with the unveiling on Cisco Spark. Can you tell me a little bit what it felt like for you and your team when you took the black sheet off the Spark Board? Rowan Trollope: Awesome! While Spark Board itself was not in development for 3 years, it was in essence the ‘physical embodiment' of our 3-year journey – to bring magical, affordable collaboration experiences to everyone. Our Spark platform and hardware (including Spark Board) are innovating all areas of workflow for employees – from video conferencing, to messaging, to meetings, to presentation sharing. This is a very exciting time to be leading Cisco's Collaboration Team – I can't wait to share with everyone what else we do this year (hint, hint). Focus Magazine: The world of IoT and collaboration – at least from an outsider's perspective—seems like it's moving at breakneck speed. How challenging is it to keep up with the pace? Rowan Trollope: Actually, not too hard. I enjoy the pace. But I'm also not too worried about the pace because we have a great strategy, amazing talent and exciting work in the pipeline that I believe actually takes this momentum into consideration. We recognize that the billions of things coming onto the Internet every month can be overwhelming for network operators and our solutions are designed to automate this more while providing the security and intelligence needed within each device that IT departments want. Stay tuned through 2017 to hear about the solutions we are providing to our customers and the impact we believe it will have on the industry. Focus Magazine: What originally got you interested in a career in tech? Rowan Trollope: To be honest, I think it was my destiny. I am an Engineer at heart. I love to tinker, I like to program software, basically I like to create. And while I get to be creative in my other passion, painting, I think the tech industry is where all of us get to be wildly creative – where we are only harnessed by the limits of our imagination. Building new products and magical experiences for our customers lets me put my love of design and creating technology into one space. Not to mention, I enjoy the collaboration I get to have with really smart people here at Cisco as we work on something that can make an impact in people's daily lives. Focus Magazine: If you could go back and give your 22-year old self advice—what would it be? Rowan Trollope: Listen more and never stop learning. While I think I do both of these things well, I strongly believe that we as individuals can always learn and grow. Recently, I have been working on the impact technology will have on the workforce of the future – and what we as technologists and socially conscious business leaders can do to help in the transition. I would have challenged my 22-year old self to step outside the tech-only view and look at the impact to society the technology I was developing would have.